Please visit our Facebook page for up-to-date information about weather-related closures. We love dogs, but please note that all dogs must be leashed in the park, and are not allowed in the pavilion or on the ride. Get Subway and Bus directions here. From the West Side: Take the West Side Highway / West Street south to the Battery Place exit.This is the last exit before the Battery Tunnel underpass. See map for area parking garages. From the East Side: Take the FDR Drive south to Exit 1 – Whitehall street.Immediately after the exit, a parking garage is available at 1 New York Plaza. If you need an address to enter into your GPS or phone for directions, use 17 State Street, which is located just across the street from the carousel. 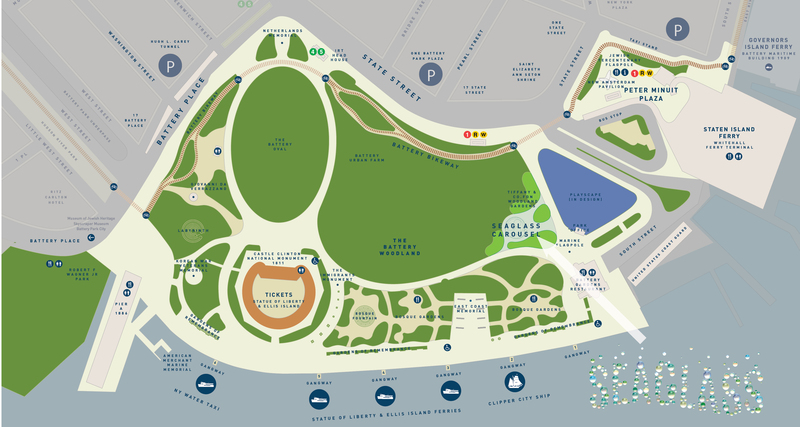 Download our map of The Battery to view or print.